When I went to purchase a tree friendly hammock suspension system at my local REI, the sales rep in the funny green vest looked at me like I was high. “What is it you’re looking for again?” she asked, as we circled the camping department once again. “A tree friendly hammock suspension system!” Why is this so difficult? Even my wife was chuckling under her breath as we searched aimlessly. And there, appearing randomly right before my eyes, was the Eagles Nest Outfitters SlapStrap suspension system. We probably walked right by it a half dozen times. Let me tell you, proving two incredulous women wrong at the same time is a glorious—and far too infrequent—moment. “Oh, I didn’t even know we carried such a thing as a tree friendly hammock suspension system,” green vest lady said. First, let me explain why I wanted a tree friendly suspension system. The guy who lived at my house before me hung a hammock as well, but he decided to drill a hole into the tree. The tree obviously wasn’t too excited about that decision. Made of nylon webbing, the SlapStrap is the easiest solution to taking care of the tree you’re hanging from.You’ll keep trees the world over happy. The SlapStrap comes in pairs, packaged neatly in a mesh carrying case. 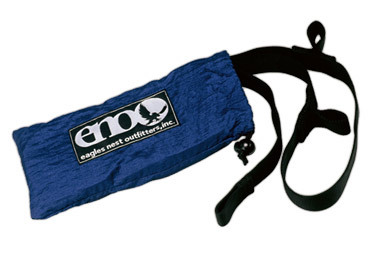 Each strap has 6 loops, allowing for flexible adjustment and creativity when it comes time to hang your hammock. You could complete your lightweight backpacking hammock system with an ENO SingleNest Hammock, or do as we did, and bargain with a dude in San Jose, Costa Rica until he offers you a price on a plain ol’ hammock you can’t refuse. So go ahead: ask your local outfitter for a tree friendly suspension system. Dance a small victory dance when they finally realize what you’re talking about. Sounds like you’re headed somewhere buggy! Nice post. And nice to have a hang system that doesn’t need tools and can travel with you.